In her typically upbeat, friendly, and candid style, popular Brio columnist, Andrea Stephens offers teen girls a Christian perspective on personal matters like their bodies, friends, families, boys, school, stress and more. She offers an insightful introduction to God, His concern, His love, and His leadings. Included are the testimonies of girls who have been featured in Brio magazine. 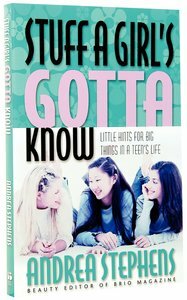 About "Stuff a Girl's Gotta Know"
The zillion things a teen girl needs to know in life are all together in Stuff a Girl's Gotta Know. Popular teen author Andrea Stephens addresses girl stuff, growing up stuff, girlfriend stuff, God stuff, guy stuff, and grades 'n stuff. This upbeat and practical advice will help high schoolers deal with issues such as decision-making, modesty, abstinence, job interviews, finances, friendships, dating, college preps, really knowing God, and more -- all from a biblical perspective. Book jacket. Andrea Stephens, former professional model and youth director, is the author of fifteen books for teens. She is the founder of The B.A.B.E. Seminar Seriesb" for teen girls, teaching them they are beautiful, accepted, blessed, and eternally significant. She serves as beauty editor, columnist, and coordinator for the nationwide Brio Girl search for Brio magazine, as well as editor of B.A.B.E. MiniMag. She is currently completing a degree in biblical studies. Andrea and her husband live in Ft. Myers, Florida.